Terrific Tuesday Challenge - Tag you're it! That's right - it's a lipstick/lip balm holder! 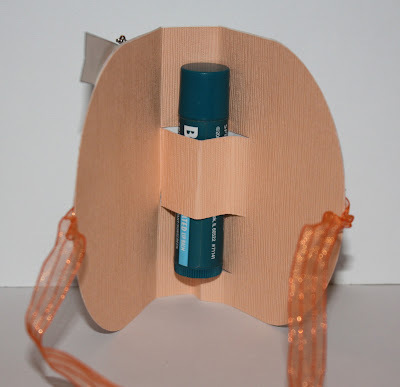 I used MTC to make the two pieces of this holder, add the ribbon in the middle like a sandwich and, Voila, a lip balm holder. 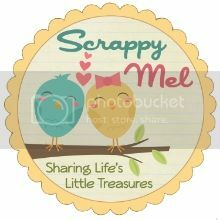 I used my Fiskars scallop circle and circle squeeze punches and our Scrappy Moms Stamps Dancing in Circles set for the medallion. I free handed a simple banner tag and attached with a decorative pin from Joanns (make those things are fragile, tried to be so careful when inserting in into the glue dot and it still bent!). The sentiment in from the SMS Mini Messages stamp set. 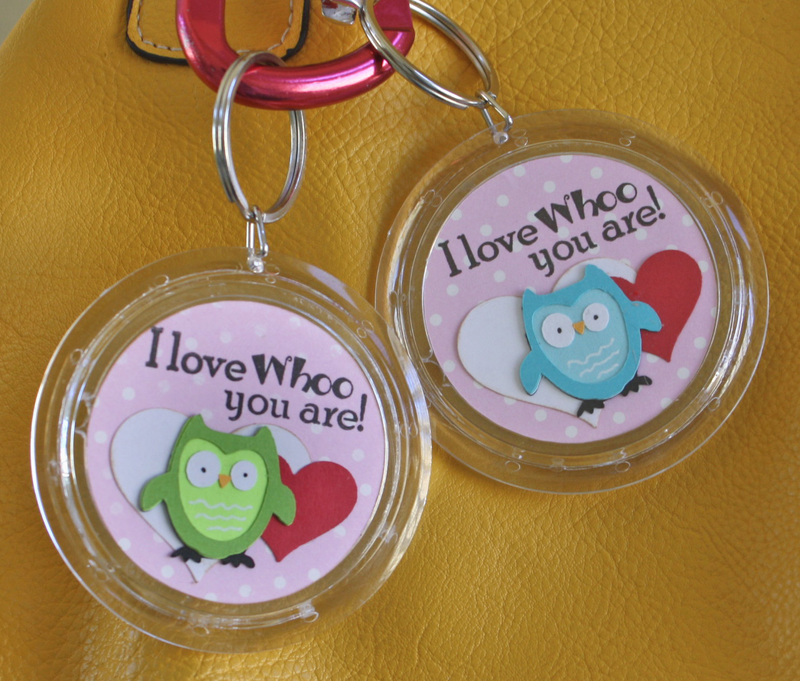 I hope that you will come play along with us and link up your "Tag - you're it" project! 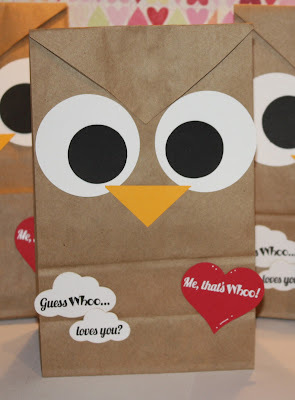 Valentine's Day - Owl Bags! 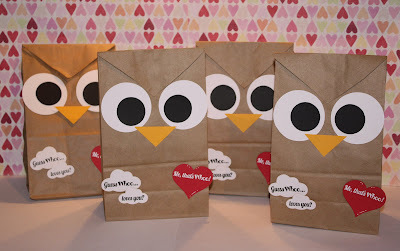 My projects today are some owl gift bags I made for my kiddo's and my hubby (couldn't leave him out, LOL). I put their V-Day goodies (including the earrings and keychains from previous posts) inside and hid them away from peeking eyes. I made the owl with 2 circle and a triangle - pretty easy, right? Then I uses my beloved Fiskar's cloud punches and a 2" heart from Lacy Lables for the sentiments - which are from Scrappy Moms Stamps Owl Occasions set. Thank you for visiting today to share some love - I hope you enjoyed my project! Sneak Peek - Owl Occasions! 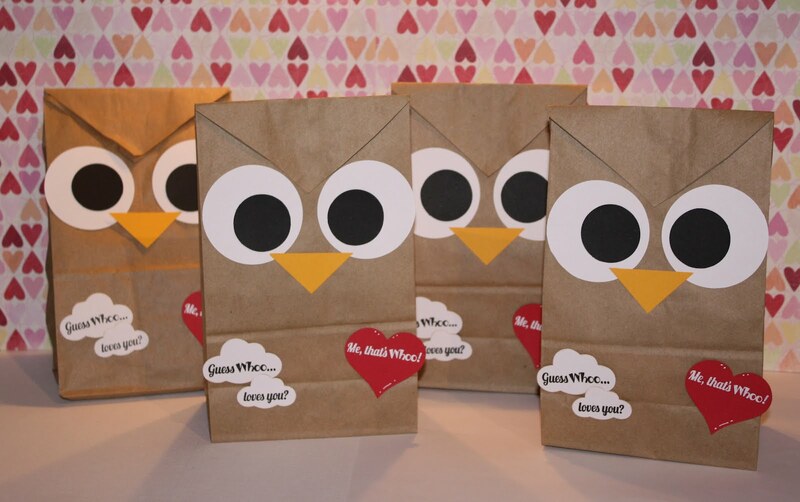 Today I am showing you another little Valentine's Day gift - I made there for my daughter's. These are actually key chains but I made them to be backpack pulls. *** Update - The keychains are from Michaels in the kids craft section. *** The little owls are from Hoot 'n Holler - I just hid the cuts on their bellies since I was only cutting them at 1". I just used my white gel pen to draw them back one. 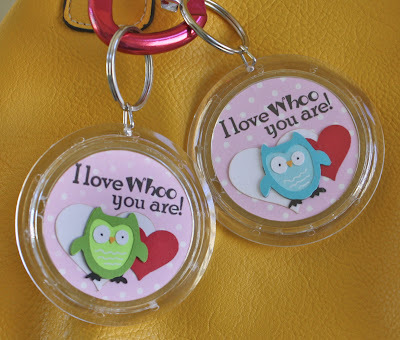 The hearts were made with the Fiskar's Squeeze heart punches and the stamp is from the brand new Scrappy Moms Stamps Owl Occasions set! I think they turned out pretty cute and I hope the girls will love them! 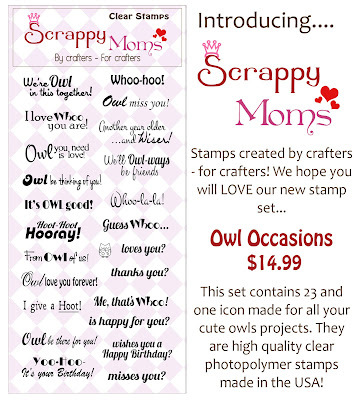 Be sure to visit all the of the Scrappy Moms Stamps DT, and our February Guest Designer - Jenni from My Lollipop Garden, this week for more project with Owl Occasions and the other February release set - Mini Messages! 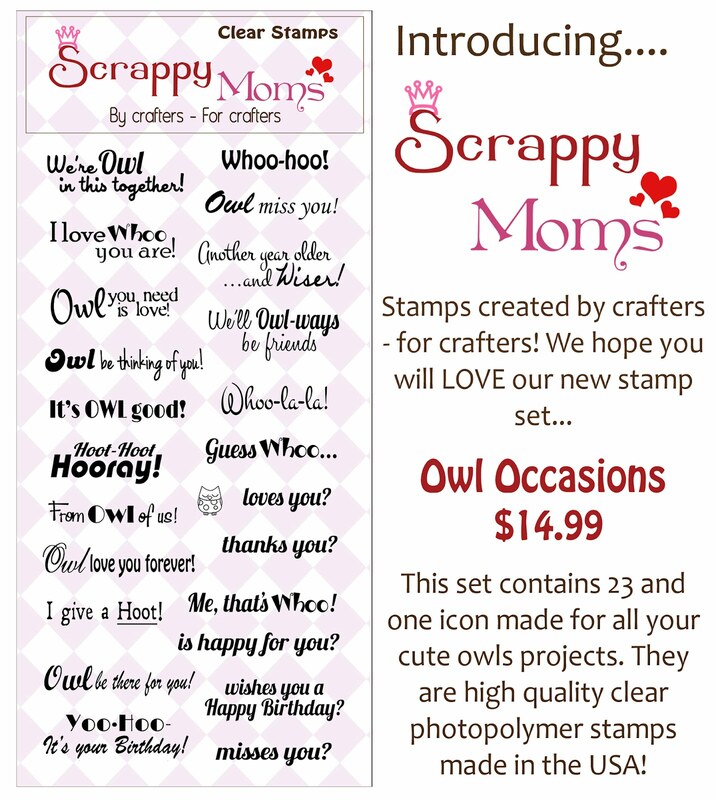 Two new SMS Stamps Sets - Mini Messages & Owl Occasions! 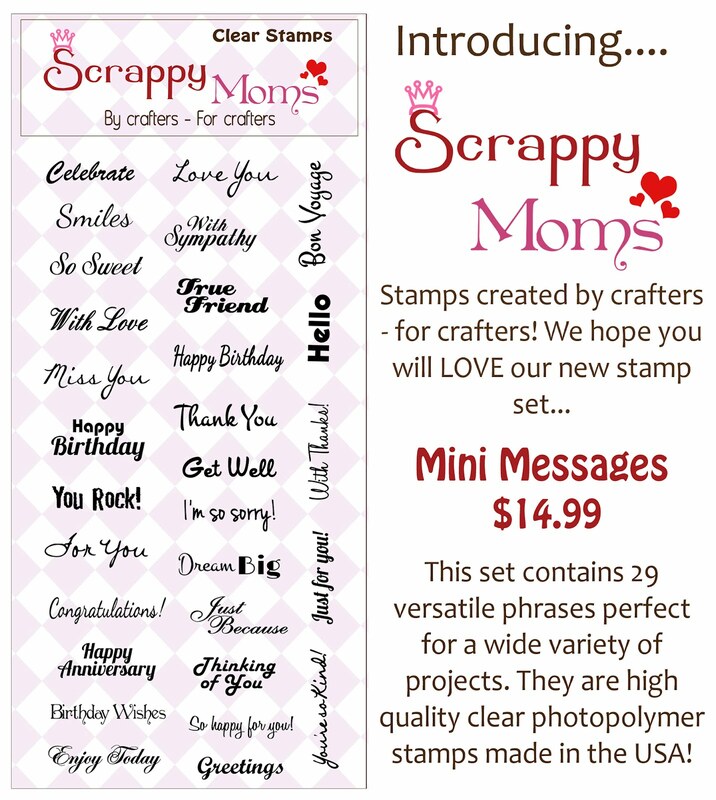 I hope you enjoyed my little project - be sure to visit the rest of the Scrappy Moms Stamps DT - including out guest designer for February, Jenni from My Lollipop Garden - for projects all this week from the two new stamp sets! Terrific Tuesday Challenge - Hearts Galore! 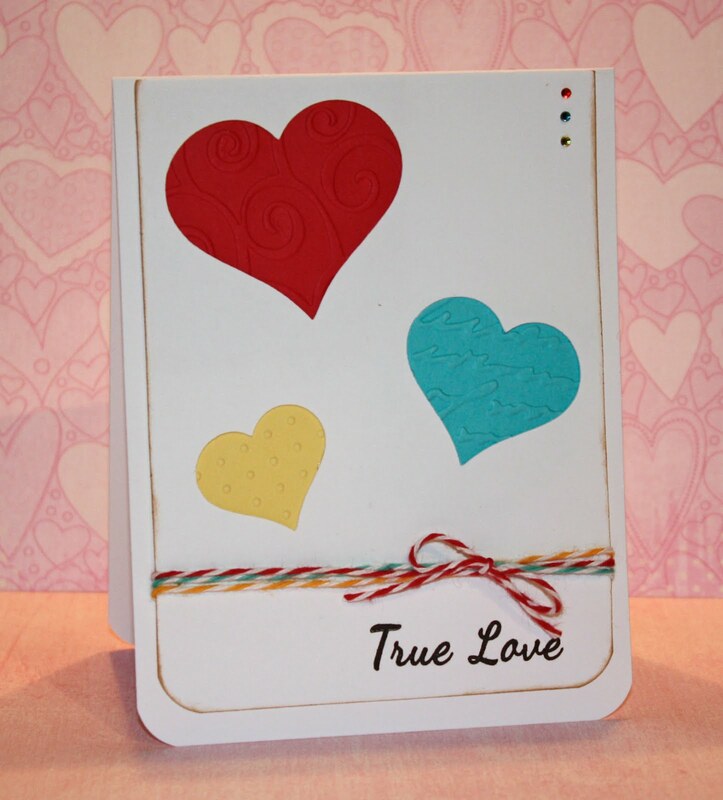 I used the heart from Lacy Lables to design the negative space the top layer of my card. I rounded the bottom corners of both the top layer and base. 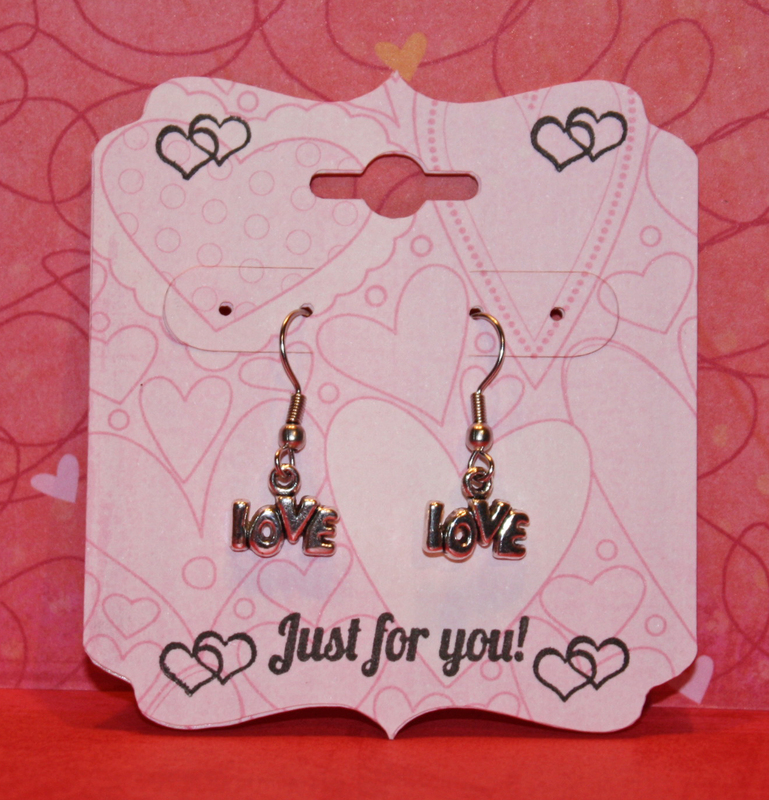 I used three squares of bright colors behind each heart shape that I embossed with Swiss Dots, Devine Swirls and the Script Cuttlebug folders. Please come by and join in for this weeks Terrific Tuesday Challenge! 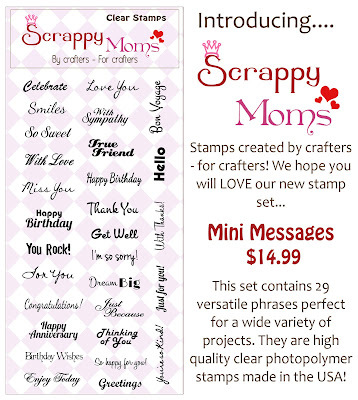 Link up your heart-themed project for a chance to win a Scrappy Moms Stamps set of your choice.